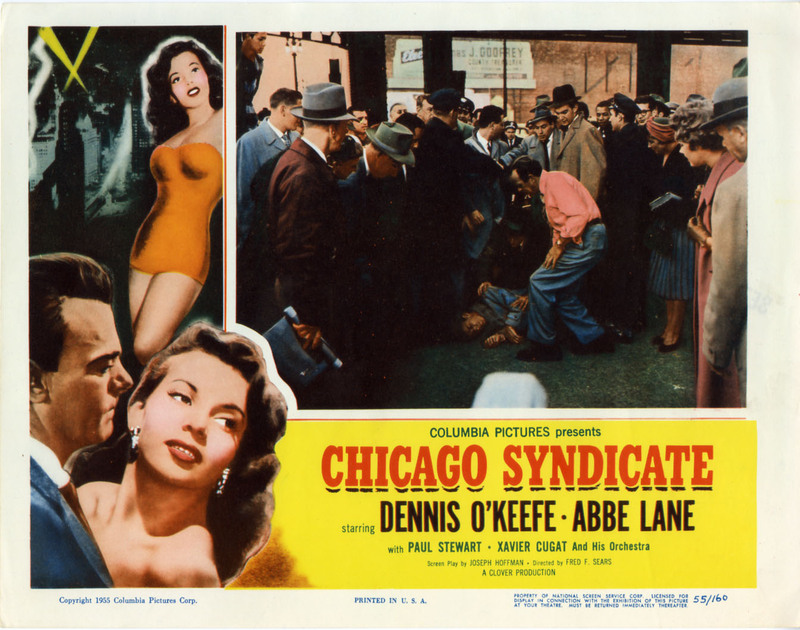 My year of watching Dennis O'Keefe movies continues, with the latest of his movies seen being CHICAGO SYNDICATE (1955), a docu-noir distributed by Columbia Pictures. I'd describe CHICAGO SYNDICATE as average but entertaining. The story is reasonably engrossing, there are nice supporting turns by Abbe Lane and Paul Stewart, and there's also some terrific Chicago location work. 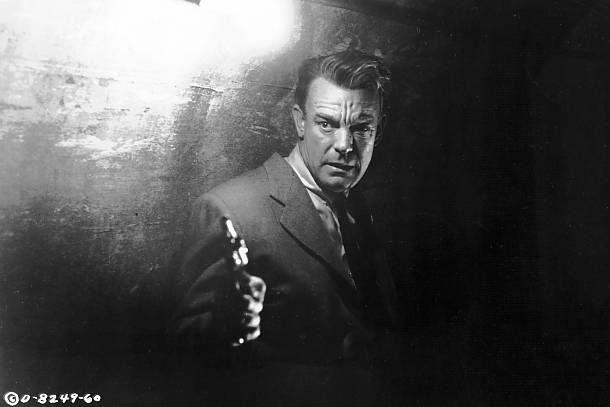 Mobster Arnie Valent (Stewart) orders a hit on his bookkeeper, who is going to inform on Valent to law enforcement, and the man is gunned down on the street. The cops turn to Barry Amsterdam (O'Keefe), an accountant with a military background, to go undercover and get the goods on Valent. Over the course of many months Barry slowly works his way into Valent's organization and then completely into his confidence. When he can, he meets with his police contacts in strange locations, including a hospital room, in order to pass on information. To Barry's dismay, Valent destroys key incriminating papers after showing them to Barry, but Barry later learns that Valent's mistress, Connie (Lane), has them on microfilm as "insurance." Meanwhile the dead accountant's daughter Joyce (Allison Hayes) has been working undercover herself, posing as a woman named Sue Morton. Sue comes on to Valent, trying to make Connie jealous and angry enough to threaten to disclose the location of the microfilm. This is a fast-paced 83-minute movie directed by Fred F. Sears. It's done in classic docu-noir style, with the voice of an omniscient narrator (Richard Cutting) filling in the blanks as Barry works his way up through Valent's organization. There's also a lot of great footage shot in Chicago, with the final confrontation between Barry and Valent making especially good use of locations. The movie was filmed in black and white by Fred Jackman Jr. and Henry Freulich. 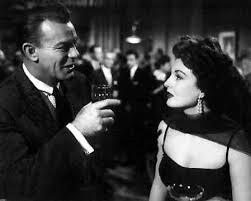 Abbe Lane does a good job with a flashy role as Valent's spurned mistress, a singer with a drinking problem. 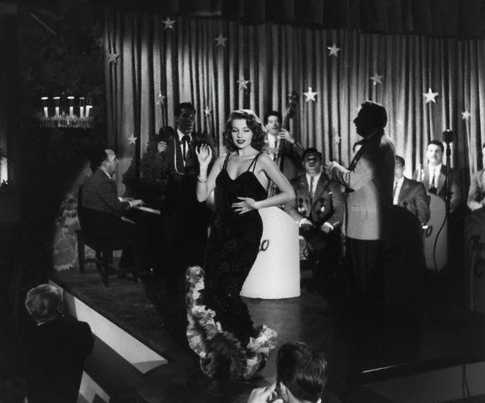 "Benny Chico," the leader of the band who backs her, is played by Xavier Cugat, who was Lane's husband at the time. I'm not sure I've seen Cugat in a film before where he was anything other than "Cugie." The music, with Lane singing "One at a Time," also adds to enjoyment of the movie. 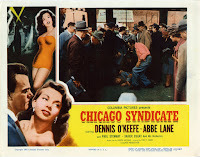 CHICAGO SYNDICATE isn't the best of the genre or the best of O'Keefe's noir titles, but those who share my enjoyment of the actor and this type of film should find it worthwhile. Dennis O'Keefe movies previously reviewed here: HOLD THAT KISS (1938), ARISE, MY LOVE (1940), THE LEOPARD MAN (1943), MR. DISTRICT ATTORNEY (1947), DISHONORED LADY (1947), T-MEN (1947) WALK A CROOKED MILE (1948), RAW DEAL (1948), ABANDONED (1949), COVER UP (1949), WOMAN ON THE RUN (1950), THE COMPANY SHE KEEPS (1951), THE FAKE (1953), THE DIAMOND WIZARD (1954), and LAS VEGAS SHAKEDOWN (1955). I also spotted Dennis O'Keefe in bit or extra roles in DEATH ON THE DIAMOND (1934), 13 HOURS BY AIR (1936), COLLEEN (1936), SWING HIGH, SWING LOW (1937), and BETWEEN TWO WOMEN (1937). With that nifty title and our boy Dennis, you know I've got to see it. The concept of an accountant being the center point in story telling related to organized crime has some serious cinematic and historic reference points. The first is Virginia Hill a mob call girl from Alabama who made her up north to Chicago, and the second is Joey Epstein, a gay mob bookkeeper and friend of Hill's. The Damned Don't Cry was the fictionalized first film to tackle this subject and work with these characters. Kent Smith, pretty well coming off as asexual in his screen work, makes an interesting Epstein. Joan Crawford is Hill, David Brian played a Joe Adonis variation and Steve Cochran, who could have been his brother, played Bugsy Siegel. Between the censors, Jack Warner and Joan Crawford their was a distortion of history, but if one knows the story, not so impossible to make a leap to what was probably going on. 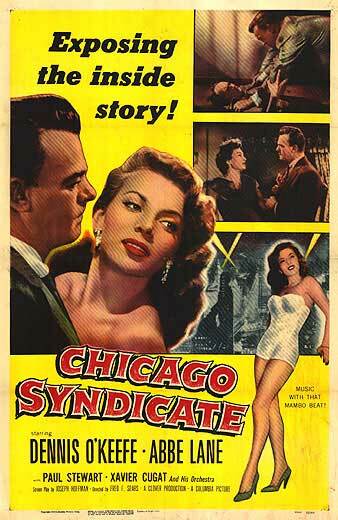 Chicago Syndicate has always been what I thought, gangs, girls and bookkeepers, a second cousin to all of this. Seeing the name Sam Katzman in the opening credits didn't lead me to expect much, but I wanted to see it for Dennis O'Keefe (and the fact that Fred Sears was the director made me think it might not be too bad.) Perhaps it was because my expectations weren't high, but I was pleasantly surprised, and quite enjoyed the film. Like you, I noticed the nice use of locations, and was impressed by the final shootout/chase. I also thought "One At a Time" was more memorable than your average night-club song, and it provided good foreshadowing for the character who sang it. Thanks to you all for the feedback. I think you'd enjoy it, Caftan Woman. Let me know if you catch it -- do they gave GetTV in Canada? They've been running it lately. I really enjoyed seeing THE DAMNED DON'T CRY at LACMA a few summers ago, Barrylane. Thanks for filling in the back story. Maricatrin, I agree, I was pleasantly surprised. Not a great film yet solid, holds the attention. The more I see of O'Keefe, the more I like him.